The Spanish region of Catalonia is found in the Northeastern part of Spain.The capital city, Barcelona, is known as a popular tourist destination with its captivating art, architecture, landscape, and Liga de Fútbol Profesional. However, in the past decade, the region of Catalonia has become divided between the citizens who are pro-independence and those who are not. Carlos further explained that what has heightened the tension in Catalonia is result of manipulation in Catalan media and government. To help you visualize, think loosely in the context of the issues that caused the Revolutionary War and the Civil War here in the United States. Loyalists vs. Patriots and Yankees vs. Rebels. In Catalonia, part of the population believes that separation from Spain is in their best interest. Generally speaking, the separatists believe that removing themselves from Spain will increase wealth because their wealth will not be distributed among other regions. They also believe there are huge cultural differences between themselves and the rest of Spain. All in all, believing they will be more successful on their own and want to do be independent of the Spanish Government’s approval. The Spanish government, declared that such a vote is unconstitutional and despite the warnings Puigdemont received of national police coming to stop the electoral procedure, the referendum still took place. Consequently, the Spanish police force was sent by President Mariano Rajoy to halt the voting from occurring. Puigdemont was aware that Catalonia would be reprimanded by going ahead with the referendum. Videos of police brutality are viral, showing graphic content of Spanish police seizing the voting stations and protests around Barcelona because of their refusal to cease voting. The Catalan government publicized these videos to fuel their fire for independence even further. On October 10th, separatists were eagerly waiting to celebrate their new found independence. However, Puigdemont announced that the declaration of their independence would be postponed until further negotiation with Madrid. Prior to the declaration, many huge business corporations fled Catalonia to protect themselves in case Catalonia became independent. Not to mention, tourism has gone down 30%. These are HUGE losses for Catalonia, and that is his reasoning behind stalling his decision. How does this political unrest affect your family? He also spoke on the fact that the political tension is just a very uncomfortable situation. His family is not pro-independence, but some of their friends are. Conversations are often like walking on broken glass. Puigdemont was given until October 16th, to decide whether or not he is to declare independence. If he declares independence he will be given an additional 3 days to rectify the declaration. Either way it seems consequences will prevail. 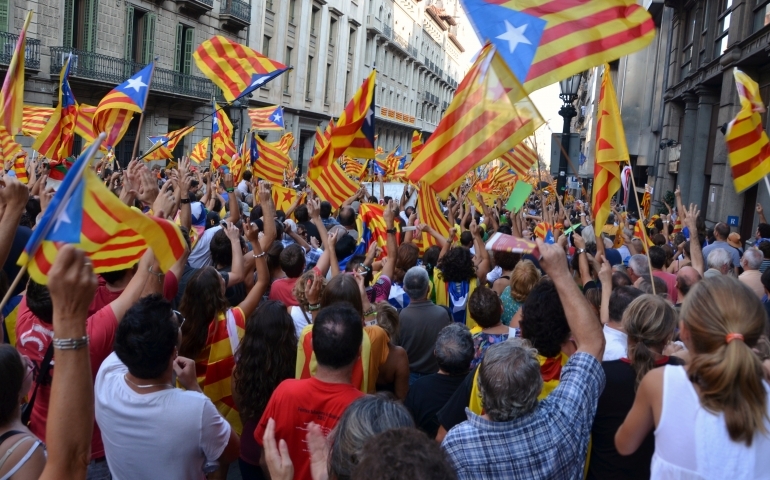 Although the likelihood of Catalonia becoming independent from Spain is slim, the events have already noticeably affected the Catalan economy and their unity as a region.